Companies increasingly need to do more with less, innovate faster, and improve operations. Rigid companies fail. If you want your company to thrive in 2014, make AGILE REINVENTION your goal. Companies that practice agile reinvention are more innovative. Ten steps ahead of their competitors. They develop and launch better products. They achieve the greatest financial returns. 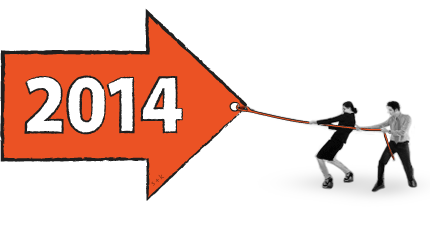 We dare you to become more inventive, reinventive, and innovative in 2014. • 36 tools to spark great ideas during the "fuzzy front end of innovation"
Does your company excel at agile reinvention? Take RE:INVENTION's free 15-question DIAGNOSTIC TEST. We'll reveal how you stack up versus your competitors. Get 100+ Free ""Agile Reinvention" Tips RIGHT NOW. Learn how RE:INVENTION'S PROCESS can dramatically improve your company's business performance, boost your agility, and help you create a culture of continuous transformation. A New Year's Gift ✰ Lucky You! To kickstart your 2014, we're giving RE:INVENTION Report readers a complimentary 30-minute business planning consultation and a $200 credit on your next project. Share this gift with a friend or business partner -- simply forward them this email. For over a decade, RE:INVENTION, an innovation consulting firm, has increased business performance and jump-started stalled growth for 60+ clients, from Fortune 500 leaders to Inc. 5000 startups. We're change agents who have helped companies invent over 40 new products and ventures and reinvent lackluster brands and business operations.